Barbara Gail & DrumRise! 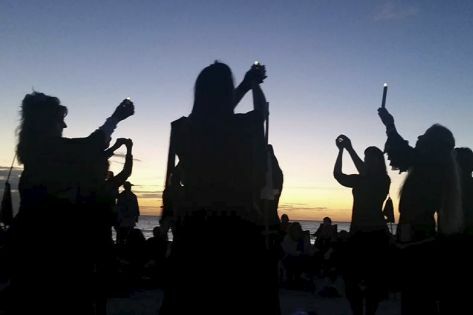 The Art of Women’s Drumming, Winter Solstice, Nokomis Beach, 2015. Join Barbara Gail & “DrumRise! The Art of Women’s Drumming” in a memorable & meaningful participatory ritual journey to honor the the longest night of the year, & the return of the light as days will now grow longer. We clear away the old & that which no longer serves, preparing fresh ground for the garden of new intentions. Bless the past, gift ourselves the present, envision the future. This ceremonial passage led by Barbara Gail, Minister & Priestess of The Drum, The Song, & The Dance, includes ritual, journey, meditation, candlelight, SongChant, symbolic movement, drumming accompaniment, & LightDancers! We’ll bury the past in the deep & compassionate earth, then descend into & sit in silent darkness, like seeds planted in soil, where dreams are born. Then we bring forth the light, joining hearts & hands in song & celebration of life! Welcome men, women & interested teens. What to Bring: A battery operated candle for yourself & each person coming with you. Some will be provided; extras are welcome. Everyone MUST have one! Dress for being outdoors in a 90 minute ceremony that continues when it’s dark & temps are cooler, so bring your warmies! Bring a chair &/or blanket to sit upon. Optional: camera, flashlight, water. Held on Nokomis Public Beach. Join the Facebook Event Page! You’ll also find all the details there.